After decades of protecting other people’s properties, veteran firefighter John Davis was forced to point the hose toward his own home during yesterday’s bushfire emergency in NSW. “I’ve been in some pretty big fires but when it comes to your own, it’s a different story,” the 72-year-old army veteran said. Yesterday’s extreme dry heat and fierce wind gusts created a perfect storm of fire conditions in NSW, with 51 blazes igniting across the state. One of the worst hit areas was around the town of Tabulam, west of Casino, where firefighters were unable to get control of an intense blaze all afternoon and into the evening. Fire ripped through the Jubullum Aboriginal community just out of town, and an unknown number of structures were destroyed. John and his wife Amanda own a property called Dingo’s Run, which they decided to stay and defend as it became surrounded by flames. “It took off like a freight train. It was roaring and suddenly it was on top of us,” John told the ABC from his verandah as the fire burnt on. “The wind kept it moving so before we knew it the fire was in front of us, beside us and behind us,” Amanda said. But even as the flames surrounded him, John’s mind was on others. Immediately he ran to his neighbours to alert and calm them. “I just like helping people out,” he said. John is not only a Rural Fire Service (RFS) volunteer, but a surf lifesaver who also served his country in Vietnam and Iraq. After helping neighbours, he returned to Dingo’s Run to help Amanda fight for their property, working the hoses for hours with the help of RFS crews to save his home. “It was eerie. You could just hear the water bombings overhead and the sound of trees snapping and falling,” Amanda said. While the home was kept safe by John, the couple’s prized garden did not enjoy the same fate. Stretching over 2.4 hectares of the 8-hectare property, the garden represents more than a decade of tender, loving care by the pair and by aficionados from local gardening clubs, who visited often to see the fruits of their labour. The fire did not spare the beauty of the rose gardens, Japanese gardens, tropical or cottage-style displays. “We’ll just have to take a breath and start it again,” he said. “It’s going to be some work again, but that’s what you do out here I guess,” Amanda said. Despite being pushed to their limits, John and Amanda ended their battle with calm surrender. The blaze was downgraded to watch and act level overnight. It has so far blackened almost 4,000 hectares. A separate fire near Inverell was also downgraded overnight, however it has scorched more than 5,600 hectares of land. Several schools are closed today, including Gilgai Public School, Tingha Public School, Bundarra Central Public School and Kingstown Public School. Firefighters and aircraft were yesterday unable to slow the spread of the blaze towards the townships of Tingha and Old Mill, north of Tamworth. RFS Commissioner Shane Fitzsimmons warned there was “every prospect” of the flames reaching Tingha, which has a population of about 800. Inspector Ben Shepherd from the RFS said there were more than 400 firefighters battling 40 blazes across the state, but the two out-of-control bushfires in the state’s north east were commanding about 100 firefighters each. “Our concentration of effort remains in the Tenterfield and Inverell areas with the Bruxner Highway fire and the Tingha plateau fire,” he said. He said conditions had eased across both the fire sites. 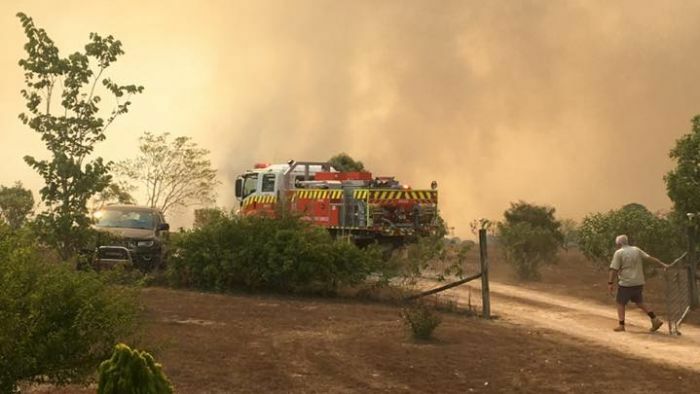 “Some … people were allowed to return to their homes last night, especially around the Tingha fire … but those residents should be mindful that they need to monitor conditions,” Inspector Shepherd said. However emergency services are preparing for conditions to deteriorate throughout the day, as the area endures hot, dry and windy conditions. Inspector Shepherd said structures were lost at both of the major fire sites. “At this stage there is the possibility of some homes but we have to go onto those fire grounds and actually assess whether they were occupied and whether or not they were actually sheds,” he said.